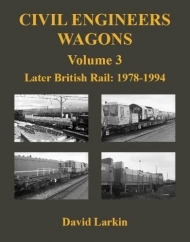 The first five Kestrel Railway Books volumes by David Larkin looked at the revenue-earning wagon fleet operated by British Railways and its immediate successor, British Rail. 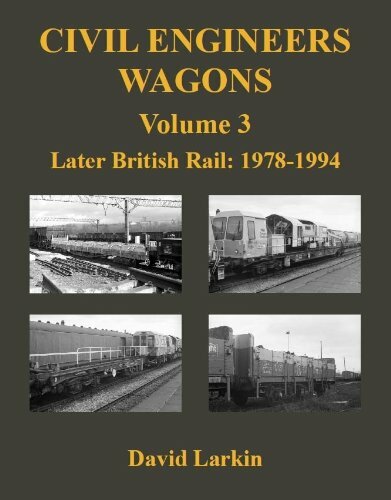 This volume is the third of three looking at the substantial fleet of specially-designed wagons that were used for track maintenance, and covers a significant change to the wagon fleet from 1978 to 1994. Concurrent with British Rail freight operations generally, there was a positive move towards fully-fitted trains on all regions of the system. On working ballast trains, this could be accommodated by using the vacuum-braked examples of suitable designs, and the early years of the period saw the gradual elimination of unfitted stock, either through withdrawal or by the application of automatic braking systems. To get Civil Engineers materials to the various depots, air-braked stock was either built new, transferred from the revenue-earning fleet or, eventually, rebuilt from existing stock. Finally, the on-track plant fleet became more standardised and a new concept of "virtual quarries" was introduced, where ballast was stockpiled at specified yards and reloaded into hopper wagons or other types at those locations, rather than at actual quarries, such as Meldon.